Public advised to Be Aware as winds of up to 80mph are forecast from Tuesday through to Thursday. A powerful winter storm will hit Scotland this week with high waves and gale force winds set to batter the country’s coast. The Met Office has issued a Be Aware warning for Scotland, Northern Ireland and northern England from Tuesday through to Thursday. 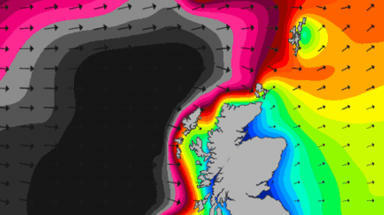 Forecasters have warned of disruption to ferry travel as winds hit speeds of up to 80mph in the north west of Scotland. STV weatherman Sean Batty said: “It’s going to be a very unsettled week, with stormy conditions on Wednesday. “Winds will pick up across the country during Tuesday afternoon with heavy rain spreading east. Gales are likely across the north and west, with severe gales or even storm force winds by Wednesday in the far north. “The storm system has a very long and straight north-westerly fetch all the way from southern Greenland. This will bring a very large swell and heavy seas to the north and west of the country. The Met Office has warned of disruption to travel across Scotland as the weather worsens. A forecaster said: “We’ve got some very strong winds expected. There will also be some big waves and very high seas. A spokesman for ferry operator NorthLink said: “We have a dedicated team in place to ensure forecasted weather and sea conditions are monitored and customers are notified of operational updates. An Orkney Islands Council spokeswoman added: “In Orkney, possible disruptions to inter-island ferry services, as well as to ferry links to the Scottish mainland, are expected due to the forecast high winds. Western Isles Council’s emergency response group, WIEPCG, met on Monday to plan their response to the incident. A spokesman said: ‘This alert is for coastal flooding. Very high waves are expected to affect the area from Tuesday morning. “Exposed coastal areas including roads, causeways and low-lying properties may be at risk from flooding due to wave overtopping particularly during periods of high tide." Michael Avril, the RNLI’s community incident reduction manager in Scotland, said people should exercise caution on Scotland’s coasts this week. 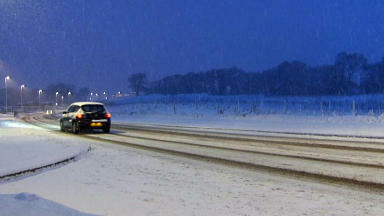 Snow is expected to arrive in parts of Scotland later this week as heavy rain closes in on Wednesday and Thursday. Mr Batty added: “Snow could also be an issue this week for some areas, again something we haven’t experienced for a long time, after the mild conditions of last winter. 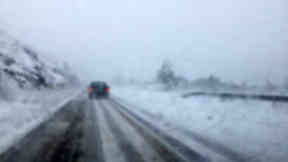 Snow will mainly settle on high ground, although will fall to low levels in heavy showers. "Heavy rain, sleet and snow showers will come through on the strong winds on Wednesday and are likely to affect all areas, although the worst of them will tend to be across the north and west. “The wintry mix of showers will continue into Thursday and with strong winds this will lead to blizzard-like conditions over high ground. “We’re also keeping a close eye on a small low pressure system that could swing across southern Scotland on Thursday night which could bring the risk of sleet and snow to southern and central Scotland.